If you’ve ever taken up cooking in World of Warcraft, you know that the game is packed with delicious cooking recipes that are unfortunately trapped inside the virtual world of Azeroth. However, some real-world chefs have taken this as a challenge to bring Azeroth to us (at least in a culinary sense), like Little Miss Nerd Chef. We wondered just what went in from turning virtual cooking into real cooking, so we caught up with her to ask how — and why — she brings these recipes to life. Blizzard Watch: Which Blizzard games do you play, and as what? Little Miss Nerd Chef: The only Blizzard game I played seriously was World of Warcraft. I started playing when Burning Crusade was released and I played a Shadow Priest. I was a bit more serious during Wrath of the Lich King and played a Frost Mage. I had a great arena team going and had some pretty sweet gear. Once Cataclysm was released I turned into a very casual player. I have the latest expansion, but I haven’t had any time to play it! I also briefly dabbled in StarCraft. I was terrible at it. I did play Zerg, though! BW: I see you have a professional cooking background — but what drew you to making recipes based on geek culture? LMNC: I graduated from Le Cordon Bleu in 2008 with a degree and have worked in professional kitchens, but I don’t like it nearly as much as I like cooking in my home. Working in kitchens you sometimes don’t have as much creative freedom to make what you would like as you do in your own personal kitchen. When I’m in my kitchen I like to experiment with different flavor profiles that you don’t see at every restaurant you dine in. As for my inspiration on making geek-themed recipes: I had a Game of Thrones Season 4 viewing party at my apartment. 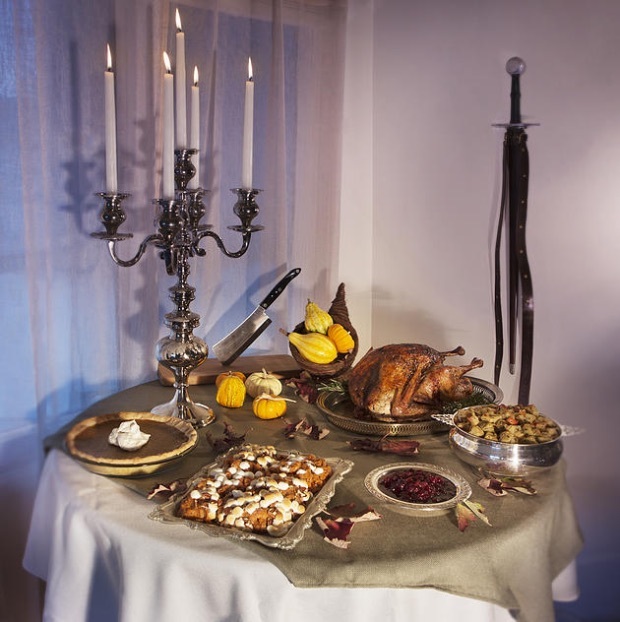 I made a ton of food referenced in the books and the show such as lemon cakes, baked apples, and how to cook every f****** chicken in the room inspired by The Hound and his outburst. After all my guests had left I started to think as I was scrubbing away at the dishes, and it finally clicked. Why not combine my two loves — food and geek culture? Thus littlemissnerdchef.com was born! I wanted to create recipes that people would want to cook at home and for their friends, and not things that just looked cutesy and nice on Pinterest. I wanted people to truly have a sit-down nerdy meal, because we all deserve it. BW: More specifically, why World of Warcraft recipes? LMNC: Gaming-wise I have dedicated the most time to World of Warcraft, so naturally I would want to duplicate some of the food I’ve seen whilst traveling through Azeroth. Also, that game gives way to so many different recipe possibilities. There are literally hundreds of recipes in that game that can be recreated, and I find that so exciting! BW: What goes into putting together a Warcraft recipe? Is it about finding a recipe that’s similar to what you’re looking for and tweaking it as needed or do you start from scratch? LMNC: My main requirement in creating each recipe is it has to be something that people will want to cook for their family. Quite frankly I’m kind of tired of seeing recipes that look like things in geek culture, but have no significant ties to the inspiration other than appearance and are incredibly hard for the average cook to execute. The first step is looking at the mats that are used in game and making it a point to integrate Earth’s comparable ingredients into the dish. Let’s use my Spice Bread Stuffing recipe for example. In the game the recipe calls for Spice Bread and Autumnal Herbs. I created a Spice Bread recipe, which calls for Simple Flour and Mild Spices in game, so I made a Mild Spice recipe and of course included flour. For Autumnal Herbs I wanted to use ingredients that would compliment the Spice Bread recipe, along with other Thanksgiving recipes I created for my Pilgrim’s Bounty event. BW: How do you know you’ve got the right taste when all you have to base it on is virtual foodstuffs? LMNC: I try to consider the environment from which the recipe originates. For instance, in my World of Warcraft, Game of Thrones, and Skyrim recipes I try to keep a rustic and earthy vibe to them. The recipes that are based of more whimsical sources like Legend of Zelda and Harry Potter, I try to incorporate a little bit more interesting flavor profiles such as kiwi jelly, spiced pumpkin soup, and shepherd’s pie with fresh herbs and wine. BW: How long does it take you to come up with a recipe? LMNC: I would say on average it takes about 2 – 3 tries to get a recipe right. I first brainstorm a recipe, write down what ingredients I want to use, and write the measurements and steps as I make it. If there are any issues I notice after the first run I can usually correct them the next time I make it. BW: What’s your favorite of the Warcraft recipes you’ve posted so far? LMNC: That’s definitely a tough one. It has to be a toss-up between Dragonbreath Chili, Spice Bread Stuffing, and Stuffed Lushrooms. The flavor in all of these dishes are so intense. The Dragonbreath Chili is very hot, but isn’t overbearing. 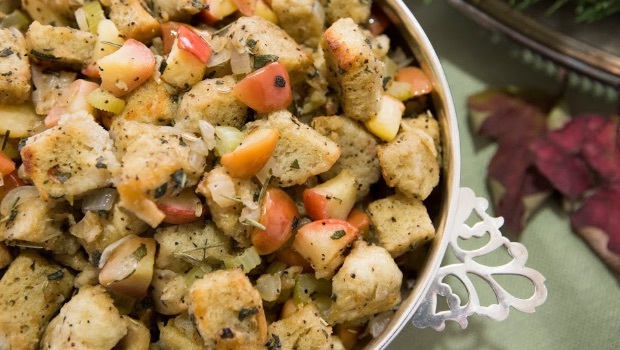 The Spice Bread Stuffing is so tender and has an abundance of earthy flavors. 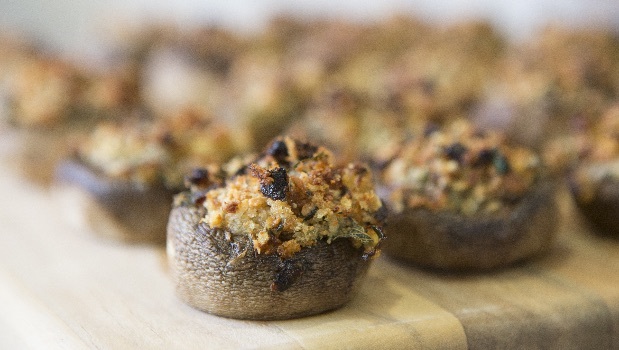 Finally, the Stuffed Lushrooms recipe makes a fantastic appetizer. They taste very hearty without having any meat, and are made with Japanese bread crumbs which result in a very light, crispy texture. BW: Any ideas on what you’ll be cooking up next? LMNC: I would like to make a recipe based on the new expansion. I was thinking of recreating Fat Sleeper Cakes (the icon totally looks like a meatloaf) or maybe Gorgrond Chowder, because judging from the mats I think it would make a pretty tasty soup. I am always taking suggestions for recipes as well, so if anyone would like one of their favorites World of Warcraft recipes recreated they can always contact me via my website or social media! Photos courtesy Patrick Kreidt Photography.